Christian (Connor Corum) is a young boy who is having a hard time connecting with his busy father Mitch (Michael Cassidy). Mom Michelle (Sarah Lancaster) just wants everyone to be happy but isn’t happy with how much Mitch is working. When Christian is bullied at school, out of nowhere a dog comes to his rescue and follows him home. The little boy names him Pluto, where all dogs come from according to Christian, and the family embraces him. When Mitch becomes so distracted that he almost loses their youngest daughter – it is time for the family to make some changes. Moving to a small town in Colorado, Mitch is back to writing again but his relationship with son Christian isn’t any better. He decides the best thing to do is gather up a few neighbor boys and take them all out camping with Christian. The one thing is that the rest of the family wants Pluto to stay with them! Their first night camping there is a snow storm and Pluto seems edgy. A bolt of lightning comes out of nowhere as Mitch and the boys are struck. When the boys wake up they realize that Mitch hasn’t and Christian prays for his Dad to wake up and when he does they all realize what has happened to Pluto. It’s a mysterious friendship created with faith! 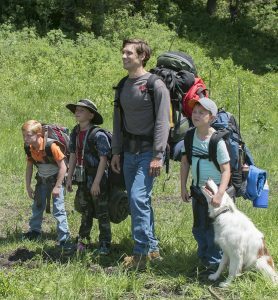 I had the opportunity to speak with Michael Cassidy who portrays Mitch Davis about the film and his thoughts about making such a touching and heartwarming family film. Jeri Jacquin: Thanks for taking the time to talk with me today Michael. Michael Cassidy: Of course Jeri, I appreciate you taking time as well. MC: Mitch Davis picked me when I was with my family. To this day I don’t know what of mine he had seen that made me a good choice to play him. I am grateful that he did though. JJ: Had you read the script before he picked you out? MC: I read the script before I talked to him. I was sent the script when offered the lead for the film. I gave it a read and responded immediately to it. I mean I backpack with my child, at the time we had a dog as well who passed shortly after the film was made and I am a father as well. So there were a lot of levels that I really related to. I talked to Mitch the next day after reading the script and we totally hit it off. I have so much respect for who he is as a man and a filmmaker. JJ: I was going to ask you what drew you to “The Stray” but I think it was, well, everything! MC: Absolutely, it was shot in a beautiful part of the world too. I like Mitch very much; I liked the script and the theme of the story. I was really impressed by Mitch because this is his story. JJ: The family sense of it is big. It’s really hard to find films that the entire family can go see together. Listening to you say that you’re a dad and love animals, it’s an instant draw. MC: Yes, I haven’t done a lot of things that I can take my kids to so this is a very unique opportunity for my wife and me to take the kids to the theater this weekend. It’s going to be a cool experience and I plan to enjoy it with my family. MC: Yes, I think at the heart of it the movie is about how hard it is to be a person in a family – a husband, wife or a child and even a dog. At the same time how powerful it is to love your family and what a gift it is even when it’s difficult. JJ: Is there anything particular about the film that touched you most of all? MC: When I read the script before I filmed it and knew Mitch, I was touched. I related to the character in that he’s working all the time and it’s not working for him. I like to see characters that make mistakes. When we were making the movie I had some pretty powerful and emotional experiences around the dog storyline. To be honest, the dog didn’t register with me when I read the script but eventually Shiloh, that’s the dog who plays Pluto in the movie, played intensely in my life because of my own dog. JJ: You know, W.C. Fields says about “kids and animals” and you got both, how was that for you? MC: I really liked working with Conor (who plays Christian Davis) very much. I connected to him and felt more like he was a peer on so many levels. We were in those woods getting eaten alive by mosquitoes, chasing the dog and carrying those backpacks together. I saw an actor that was in the same challenging work environment as me and I didn’t expect that. No matter how challenging the elements are, I knew there was a guy who shared the same name as my character and had it way harder than me. I said that to Mitch, I told him it was going to be weird to be him while he’s on the set. It was a fun experience that we shared. JJ: Usually people who portray other people don’t have that person right there next to them. That had to be strange. MC: I was very upfront with Mitch when we talked about the film saying that I am not you and I have to do what makes sense to me. He was amazing! It was my biggest concern going in that he might whisper “I don’t do things like that” but he never did that. He even said, “Llook man, this is the story that happened to me and my family and you are here because you are going to do a good job telling that story.” He trusted me totally and it was very comfortable. JJ: Do you think “The Stray” being based on a true story was something else that drew you to make the film? MC: Oh yes definitely! I have been in electrical storms and had so many shared experiences with Mitch that it was just grace that my experiences in those elements were different than him. I totally connected to the elements in the exact same way as he did in his life and did it as a storyteller to be able to bring it all to the screen. I so appreciate Michael Cassidy talking with us today about “The Stray.” The film brings Mitch Davis’ story to the screen as Michael Cassidy tells the story of family, friendship and love. “The Stray” is a film about faith, hope, love, family and healing. The Davis family is like so many of us in that we all get so busy with life that we truly forget to live. In this case, it takes the arrival of a beautiful dog to bring everything into focus. This is an amazing family film that can be shared with many walks of life with a sense of unity and strength that we all can relate to. In the end – one dog can change everything!